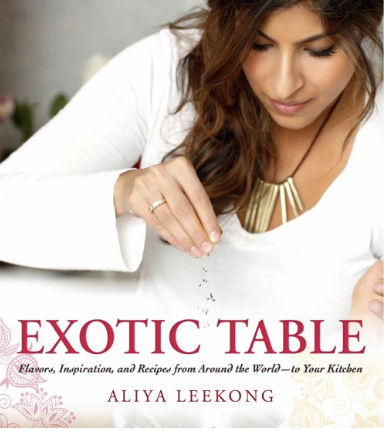 My recent favorite cookbook is Exotic Table: Flavors, Inspiration, and Recipes from Around the World – To Your Kitchen by Aliya Leekong. If you’re proficient in the kitchen, have an adventurous palate (not afraid of heat or exotic spices) and want to be challenged to try new flavor profiles, this is a well-written book by a skilled chef. There are 10 chapters full of new ideas: 1) Spices, Ingredients and Equipment; 2) Hors d’Oeuvres and Snacks; 3) Soups and Salads; 4) Fish and Seafood; 5) Poultry; 6) Beef, Pork, Lamb and Goat; 7) Vegetables and Side Dishes (my favorite chapter); 8) Breakfast, Savory Tarts and Breads; 9) Desserts; 10) Drinks. The title is spot-on. The recipes are from around the world, including lesser-known exotic locales in Africa, Caribbean, South America and Indonesia. Some people can get awfully riled up about whether something is “authentic,” but Aliya Lekong understands that there is an inevitable loss of authenticity when you move food out of its culture of origin and prepare it half-a-world away in your own kitchen. I agree with her—in my kitchen, making food taste delicious is more important than following bad recipes that claim to be authentic. That’s the way I cook, and this book has given me enough new ideas to keep me buzzing with culinary creativity for at least the next 6 months. How important is authenticity to you? Are you a recipe-follower or a recipe innovator? Previous postCarol Bodensteiner, author of the historical novel “Go Away Home” offers media marketing tips to writers. –to be inspired by taste/smell/color/travel/memory, and to create something from that inspiration… That’s the approach of a gourmet, Anthony, don’t you agree? You had me at ‘jazz cooking!’ It sounds like an inspiring cookbook. I’ll have to look for it. Good food is good food, authentic or no. As you say, it just becomes different under different influences. Although this does remind me that I was fascinated with a book I heard about on the radio – a woman of Indian heritage born here, who decided to write down all the family recipes before they were lost forever. She cooked dhal for the programme’s presenter, explained how simple and comforting it was, just lentils, garlic, and then you put your own signature on it… thinking about how terrible supermarket dhal is and how all it takes is someone to show us how it can be good, authentically. Agreed. And bad-tasting but supposedly authentic food is not good. Supermarket dhal is like supermarket hummus — belch (and they usually add chemical preservatives)! I never understand why people buy the supermarket (yucky) versions of simple dishes instead of enjoying the fresh, easy-to-prepare ones at home. I definitely do NOT value convenience over flavor. Thank you, Denise. I’ve been giving a lot of thought to priorities and returns, because I suddenly have so much going on in my life besides blogging, and I need to be wise about how I order and spend my time. I’m going to try a schedule of posting every 10-14 days. I think that will be manageable. I find that I miss my on-line friends if I don’t join in at least that frequently. I’d like to do more, but I don’t think that would be wise right now. Ken is out of retirement to do some consulting, which is fun for him, but it also involves me doing some typing for him; and I’m editing and designing a book of local history for a small press; and I’m trying to write a novel; and of course I still want to spend time with family and friends; and take care of my health. This sounds a very sensible approach. So often it’s impossible to source the ingredients you need for “authenticity” so to improvise is the only way to go. I’m not great at following recipes – my dishes never turn out anything like the photos in the book! I tend to change most recipes to suit my own tastes. But I find myself actually following these. They’re uncomplicated and I find that I trust Aliya’s palate (which means she likes the same flavors/proportions as I do). Her popcorn recipe is really cool! I am a recipe inventor and rarely follow a recipe religiously, although I love cookbooks. This sounds like a great book and I LOVE her book cover! I love the cover, too. I have to be honest; I generally am not a huge fan of television chef’s or starred chef’s cookbooks. I like cook books that are not just pretty, but well written (the kind of books Judith Jones would publish (the editor at Knopf who published Julia Childs, Claudia Roden, Madhur Jaffrey; she had good taste in writing and in food!). I also demand recipes that are reasonable for a home cook, who doesn’t have access to professional equipment. I’m really impressed with this one. It’s lovely to look at, fun to read, and the food is yummy! It’s so good to read another of your “Tracy-style” posts! I understand how you’re setting a manageable pace and good priorities for yourself, Tracy, but it’s a treat to be notified you have a new post up…and then read the details that almost make us taste the words. Thank you for this delightful post. Aw, thanks, Marylin, for reminding me why I do this–I miss you all too much if I stay away too long. Your posts, too, always bring a smile to me when they show up in my emailbox. Like a letter from a good friend. You could follow her recipes to the “T” and the results would be fantastic. They’re clear, mostly uncomplicated, and reliable. There are always two ways to read cookbooks and follow recipes (same as with music); to the letter, or as a springboard for inspiration (and both are good). It’s about personality. I like the sound of this cooking. I agree with you on the matter of authenticity. I can’t claim to be an authentic Italian, Indian, MIddle Eastern or [insert cuisine here], but I can learn about the flavour profiles of these areas and apply them in my own Canadian kitchen.